MyMemories Blog: Meet this week's Featured Designer! It's *AmyDane Designs*!! Meet this week's Featured Designer! It's *AmyDane Designs*!! Good morning!! It's Monday!! Did you all have a great Digital Scrapbooking Day?? We had a GREAT time at MyMemories! There was a fun blog train and some great challenges and giveaways! Now, back to business!! We have some BIG NEWS coming later today - but this morning our first order of business is to celebrate another of our awesome MyMemories Designers! This week it's Amy and Dana from AmyDane Designs! So, be sure to take a peek in their shop this week - they are hosting a great sale AND they are offering up offer (1) $10, (1) $25 and (1) $50 coupon giveaway to their shop for those that comment on the post and tell their favorite kit! So, be sure to comment below and let Amy and Dana know what YOU love best in their shop and it could be YOUR lucky week! Check back next Monday for the winners name! And... for sure we have some Lucky Ducks from last Monday's Featured Designer! So if you are YABBY, Sheila817 or TheLandFamily - please send me an email to get the info you need to claim your prize!! Congratulations! EMAIL: LisaJ@MyMemories.com. I have to pick just one favorite? I can't, I love Snappy and Stars and Stripes of Summer. Oh, and Game on and Graffiti. You can disqualify my comment if you need just one, they are all awesome! Love Amy Dane! they have fantastic kits! my fav is stars & stripes of summer! thanks for the chance! I love fresh and funky. Thank you for the chance to win. Have a blessed day. I'd love to add Stars and Stripes of Summer to my scrap stash. Thanks for the chance. I love your designs/kits -- there are quite a few that I'd love to have! I love The Most Wonderful Time...the colors and embellishments are sooo...me! I love her designs~ One of my favorites is I mustache you! I guess if I had to chose my favorite it would be Stars and Stripes of summer, but with 2 little boys I think then next would be Start Your Engines!! What cool kits. I love the game on kit, although have you ever thought of doing one about Judo? I have such difficulty finding a Judo kit for my boys winter sport. as the mom of two boys, and no girls, I love that their kits are pretty for me and yet masculine enough to use for my boys. I know that they must have boys in their lives because of the themes :) I am hoping for a Green and Gold kit in the future, hint hint. My current favorite though is A Good Read. This was a hard choice, so many great kits! I love your ALL THINGS BLUE AND GOLD! Thanks for the chance!! Wow what a wonderful choice but if I had to choice one it would be "Splat bing Bong" Thanks for telling and showing us some of your designs.. I would have to say my favorite would be Snappy. I'm a sucker for those colors and it looks just so upbeat. 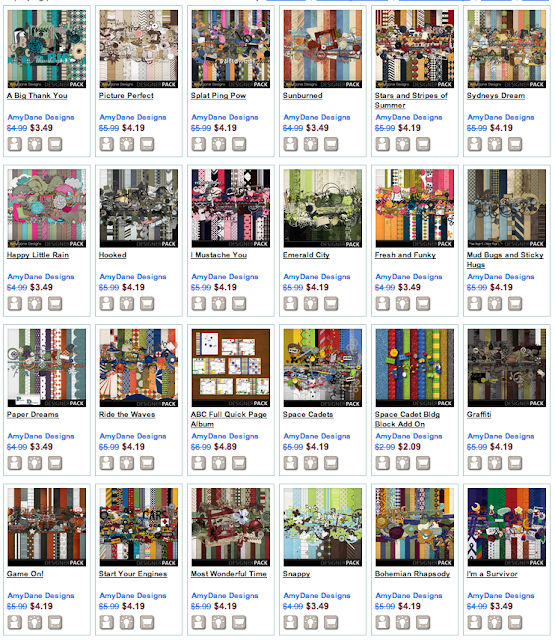 Wow- so many beautiful kits to choose from! My favorites are Sydney's Dream, A Good Read and Emerald City. Thanks you for the chance to win! Wow they are all cool, i love the vibrant colours in some of the kits and the colour ranges used are awesome. I think my favourite is Happy Little Rain, i love the colours and the brilliant embellishments with it. It rains so much here, it would be a very much used kit. Well done for coming together and making these wonderful kits for us all to share. I already have sunburned and have used it numerous times to document my time in the Southwest. I love so many of their designs, but right now I have I Mustache You on my wish list. Thank you so much for the chance to win! Lovely kits. I especially like the space cadets kit. I have loads of pics to scrap of Lego Land! What a great collection of designs. I'm particularly drawn to Something Beautiful with those soothing blues. I'm crazy about the Emerald City design! Thanks for the chance. I Mustache You is cute. Thanks for the chance!! I am so excited, Love your kits! If I have to pick a favorite it would be Snappy! I Mustache You would be my choice if I had to pick just one. I love "Start Your Engines" and think it would be grand to scrap my grandsons' photos. I like them all but I really like Happy Little Rain I love the colors in it. I love I mustache you! I really like the "I mustache you". My husband even chuckles over it. A mustache has become a joke in our house over the years so this fits well with us. Thank you. Well, I have lots of favorites...but fortunately I own a number of them already!! :-) Of those on my wish list I think I have to say Emerald City is my favorite...I have been coveting it for a while now. Today I'd pick 'Splat Ping Pow'. It looks perfect for my grand daughter's recent 6th birthday- lots of lively activity, running and squealing. I love so many of your color, pattern and embellishment combos... choosing just one is difficult. I know I would use Mud, Bugs and Sticky Hugs a lot; I'm always looking for that perfect "guy" look. Thanks for the chance to win. I have to say that my favorite is Picture Perfect and Something Beautiful. Thanks for the great chance. I'll be keepin those fingers crossed. Wow, I love them all! If I had to pick just one though it would be Fresh and Funky. Amazing work! My favorite is Sydneys Dream. I love your work. At this point in time, I have to choose "Most Wonderful Time"! It's beautiful! I think I would go for Cuddle Bug- the colors are just so cheerful and upbeat, they look like they'd be fun to scrap with! If I had to pick just one, I would probably pick Ride the Waves since I had already put it in my Wish List. But all of your kits are adorable. You all are definitely one of my favorite designers!! Love your style! !